Another day, another baby born in an airplane bathroom toilet. While this little fellow, birthed in the middle of an Emirates flight headed to Manila from Dubai, wasn't likely conceived in an airplane, being born in one should mean he'll get plenty of untoward jokes coming his way between fourth grade and forever. On August 22, Emirates flight EK 322 had to make an emergency landing in Vietnam following the sudden labor and subsequent delivery of a Filipina woman's baby. Two nurses and four flight attendants rushed to the woman's aid immediately following the delivery, which somehow - despite all imaginable spatial logic - happened in the cabin's tiny restroom. According to Fox News, one of the fortuitously placed nurses saw the mother in pain and followed her to the bathroom - here "she found the newborn inside the toilet turning bluish-brown." The phrasing is uncomfortable enough to negate any wonder for the miracle of birth. 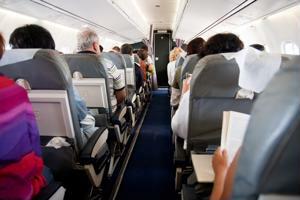 Luckily, the two nurses quickly cleaned the baby, removing amniotic fluid from the ears, nose and mouth before flight attendants administered oxygen to both the child and mother. In a clever twist, someone came up with the bright idea (pun intended) of keeping the newborn warm using LED reading lamps attached to the seats. Apparently the child - named EK, after the flight's code - was born only 27 weeks into the mother's pregnancy - not quite seven months of gestation. A number of news sources are currently reporting that the Filipina mother is in stable condition at a hospital near Ho Chi Minh City. While EK remains in critical care, everyone is hopeful for his full recovery. Young EK isn't the first baby to be born mid-flight, but the instances are rare and it's even less common to name your child after an airline code (according to The Huffington Post, a woman who gave birth in transit to San Francisco named her kid Francis, which frankly feels like a copout compared to EK's perhaps overly devoted mom). As for unusual places to be born in the bathroom, the toilet does not rank high among them. A good choice might be the porcelain sink of a solid wood vanity with an aspen frame featuring a cherry finish and brown marble countertop. Unfortunately, these are rare on commercial flights.